New Choro medias online now! We are happy and proud to introduce you to our special media section about Choro music! In addition to our cavaquinhos, sete cordas, broad range of pandeiros and small percussion instruments, we have now managed to create a lovely assortment of media for you to start, learn, teach, practise and improve your Choro skills. Now is the time to pick up some books, watch DVDs, listen to CDs and broaden your repertoire! There is an endless choice of fantastic pieces played by wonderful musicians and best of all - all those Choros are carefully chosen and ready for you to play! There are scores and playalongs, Songbooks and many ways to learn the oldschool art of Samba. Please take some time and browse through our media section, below you can find a large range of material specially for Choro music. Choro is a Brazilian music style which developed in Rio de Janeiro already around 1870. Its roots were influenced by several European dances like the Polka or the Waltz, the rhythmical background arose from African beats. Choro has grown to be a cultural and musical heritage of Brazil and is experiencing a huge rennaissance. Percussion instruments as well as harmony instruments (cavaquinho, 6- and 7-string guitar, bandolim, clarinet, accordion, transverse flute etc.) 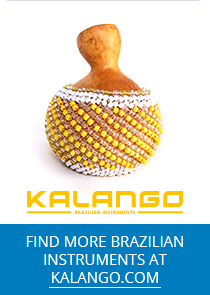 are played in Choro music which is known to be the most important ancestor of Samba. Whilst Choro used to be widely unknown in Europe, it is becoming more and more popular. Pixinguinha and Jacob do Bandolim are two of the most renowned Choro composers.